Discover some of the best trout fishing in the world, along with scenic waters perfect for boating, camping, lakeside strolls and waterfront shopping. 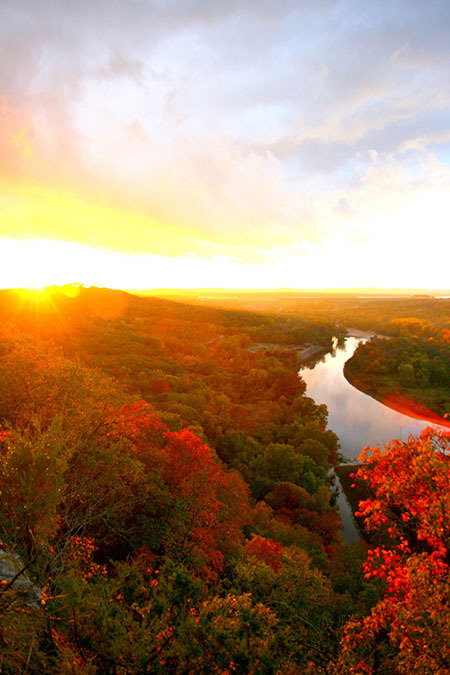 Lake Taneycomo flows through the heart of Branson and offers plenty of opportunities for wonderful vacation memories. Formed with the completion of Powersite Dam in 1913, Lake Taneycomo was originally a section of the White River. Although it’s technically a lake, Taneycomo’s narrow arms and forested shores retain the look and feel of a river. When the Table Rock Dam was completed at Taneycomo's headwaters in 1958, the nature of the lake changed as well. Taneycomo's water now comes from the bottom of Table Rock Lake (the coldest part), making it cold all year round. 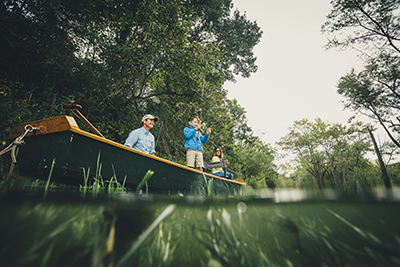 Choose from a variety of resorts, campgrounds, RV parks, and full-service marinas, as well as outfitters for canoeing, kayaking, fishing boats, motors, guides, tackle, and pontoons for relaxing and fun-filled lake activities. The Taneycomo lakefront in historic downtown Branson is also home to the Branson Landing, which includes shopping, dining, lake excursions and boat rentals, all along a beautiful one-mile lighted boardwalk. Lake Taneycomo is accessible from historic downtown Branson and at multiple points east including the communities of Rockaway Beach, Forsyth and Powersite, or south of Highway 76 in Hollister and the Fall Creek area. Lake Taneycomo is stocked annually with approximately 750,000 10-12" rainbow and brown trout, making it a world-class trout fishing destination. Different sections of the lake offer unique fishing experiences. The uppermost portion of the lake is reserved for artificial lures like tiny jigs and crankbaits. These headwaters are also ideal for fly fishing with flies that imitate the freshwater shrimp and other creatures that trout feed on. Take a tip from the locals: The best way to catch trout is by drifting salmon eggs or angleworms. Affix the eggs or worms to a small hook and cast into holes with an ultra light rod and reel. This method used from a drifting boat or from a dock will yield a nice stringer of trout. It's important to note that few places in the main channel are shallow enough to fish while wading, so drift boats and docks are typically used. Lower Lake Taneycomo harbors a well-kept secret: The downstream area closer to Powersite and Forsyth offers considerably warmer water and many different species of fish, making Taneycomo a versatile destination for anglers. Many area resorts and marinas can also connect you with an experienced guide to help make the most of your Lake Taneycomo fishing experience. A Missouri fishing license is required to fish any Branson-area lake, river or stream and a trout permit is required for fishing Taneycomo between the Table Rock Dam and the U.S. Highway 65 bridges. Anglers must have a trout permit to possess trout anywhere on the lake. Resident, non-resident and youth licenses are available at most fishing outfitters and supply stores in the area. For details about licenses and regulations, visit the Missouri Department of Conservation's site. Experience a variety of scenic, affordable resorts and cabins on the waterfront. Lilley’s Landing Resort & Marina is a year-round favorite nestled on a tranquil section of Taneycomo, just two miles from Highway 76, Branson’s Entertainment District. They offer well-kept accommodations along with a variety of boat rentals for half-day and full-day outings, and free fishing from their dock. Trout Hollow Lodge is located just a few miles away in Hollister. In addition to boat rentals at their marina, the lodge also features motel-style rooms and lake-view condos. If you’re looking for your own cabin, Trophy Run offers beautiful lakefront retreats with resort-style amenities. There are a number of places to park your tent or RV along Taneycomo. The Cooper Creek Resort and Campground offers 14 wooded acres of cabins and campsites with bathhouses and hook-ups, as well as boat rentals and a convenience store. The Branson Lakeside RV Park is located next to the Branson Landing and offers the best of both worlds—quick access to the lake with shopping and entertainment nearby. The Branson KOA and Branson Family Campground are some other favorites for staying along the lake. After a day on the lake, head over to the Branson Landing for a delicious meal at one of Branson’s acclaimed restaurants. Enjoy Mexican cuisine at Cantina Laredo, a great steak at Texas Land & Cattle or crab buckets and stuffed shrimp at Joe’s Crab Shack. If you’re picking up supplies at the Bass Pro Shop, head over to the White River Fish House and enjoy views of Taneycomo along with everything from seafood and steak, to chicken and alligator tails…Mmmm! Thinking about Branson for your next fishing trip? Find out seven reasons why trout enthusiasts love Branson.